Body Piercing – A Form Of Beauty Where Less Is Definitely More!Body Piercing – A Form Of Beauty Where Less Is Definitely More! Getting a body piercing can be a somewhat complicated process. This is because there is such a vast array of styles available – as well as places to get pierced. Gone are the days when only girls got their ears pierced – and to do so in the cartilage was considered risqué. Today, people of all genders and ages are getting pierced in some of the most unusual places. When deciding to get a body piercing, it is important to go through a professional rather than do the piercing yourself or allow a friend to do it for you. Most piercing, when completed by a professional, is perfectly safe. Some parts of the body, however, can become permanently and severely damaged if pierced incorrectly. For this reason, it is important to always consult a professional piercing specialist when considering getting a body piercing. Piercing can also be painful, though the pain doesn’t normally last for very long. For those with a low tolerance for pain, this needs to be considered before deciding to get a body piercing. To help cope with the pain of tongue piercing, some apply Orajel to the tongue before piercing it. Most people, however, don’t use any form of pain-reducer at all – it’s simply not worth the time or expense for a few seconds of pain. In addition, it’s not a good idea to get a piercing when you are sick. Your body needs to be strong and it needs to be able to produce adequate amounts of white blood cells in order to help it heal. If your white blood cells are already occupied with an illness, your body doesn’t need the extra stress a piercing will cause. If you are feeling ill, it is best to postpone your body piercing until you are feeling better. 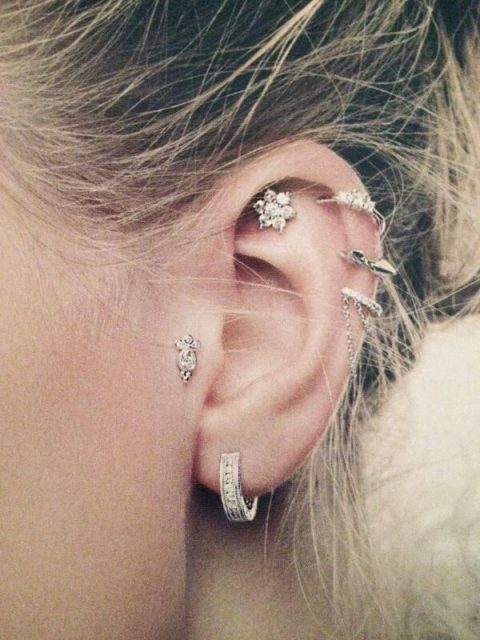 The cost of piercings varies depending on the type of piercing and the location. Some include the price of the jewelry with their costs while others do not. If the jewelry is a separate cost, the type of jewelry you choose will affect the cost. For example, Titanium costs more than surgical steel. In addition, a tongue piercing generally costs more than a nose piercing. Before getting a piercing, however, it is important to check into the policies of your place of employment. Some employers have strict rules about body piercing and whether or not their employees are permitted to have them. Getting a piercing is not worth losing a job. Similarly, it would be very upsetting to go through the pain an expense of getting a body piercing, only to be told to remove it. Some companies allow body piercing, but they need to be covered by a band-aid or some other type of disguise. Be sure to check into this before getting a piercing to decide if the trouble of covering up your piercing is worth it to you. Once you have decided to go ahead and get a piercing, you need to decide where you want the piercing to be. There are many places that can be pierced on the ear besides the lobe. In fact, pretty much every area of the ear containing skin or cartilage can be pierced. Other popular places for body piercing are on the face. The nose and eyebrow are two common places for body piercing. Some people also choose to get piercing in the chin, right below the lip. Yet others get piercing above and to the side of their lip, similar to a beauty mark. If you work out regularly, play sports, or otherwise sweat often, it is important to tend to you piercing regularly. While these activities alone don’t cause harm to a pierced area, sweat can cause the pierced area to become filled with germs and bacteria, which can lead to an infection. Be sure to shower and clean the pierced area after engaging in an activity that causes sweat to get into the area. Wherever you decide to get you’re piercing, it is important to remember that too many piercing can detract from your appearance rather than enhance it. Therefore, piercing – where they are located and how many you get – should be carefully planned out to ensure that your piercing sends the right message about you and your appearance.